← BMS : two major changes. Runner-up Kristoffer De Weert (left) and Belgian Champion 3-point matches Dan Pascu (right) just before the start of their final, played on Saturday, February 9, 2019, in the Arena, Wavre. 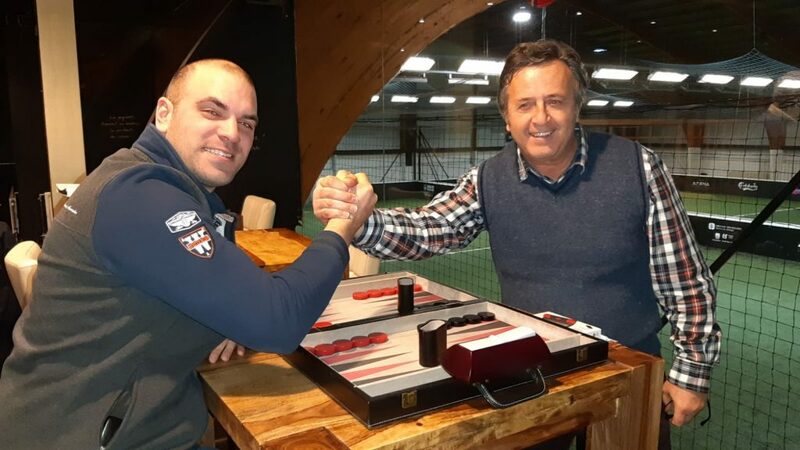 The 3rd Belgium Championship 3-point matches, played on Saturday the 9th of February in the Arena in Wavre, crowned Dan Pascu, from Turnhout, beating – rather easily 2-0 – Kristoffer De Weert in a one-sided final. Ten participants played a Swiss tournament during 7 rounds of 2 matches per round to qualify 4 of them. Kristoffer finished on top with 10 victories out of 14, together with Dan, daddy Riza Yalçin and his son Mahir. Kristoffer won his semi-final against Mahir, Dan defeated Riza. We welcomed a new BGFed.be member, Nicolas Bivort, who did well, tying all his matches but losing twice against future winner Dan. The Arena in Wavre offered nice playing rooms, breakfast & lunch ; the atmosphere was excellent. Hopefully this Championship can gather more participants next year. This entry was posted in Tournaments and tagged Arena, BC 3-point matches. Bookmark the permalink.